Is Goji Berry Plant an Invasive Pest? The goji berry plant (Lycium barbarum) is an ornamental, fruit-bearing plant traditionally grown in China. The plant has become popular in recent years for its purplish-red berries touted as an ideal superfood. The plant is now grown in many countries and has even been adapted as a backyard garden plant in the United States. The goji plant is a target for pests and diseases. Many insects and animals enjoy snacking on the tender leaves. The plants are also susceptible to potato blight and fungus disease resulting from too much moisture. Since the early 21st century, high levels of insecticide and fungicide residues have been detected by the USDA in goji plants and products imported from China. UK officials attempted to recall some 86,000 infected plants from their garden centers and nurseries. Goji plants belong to the solanaceous or "night shade" family. This affiliation gives them the potential to pass on any developed diseases to such crops as tomatoes, potatoes and peppers. Because goji plants are winter hardy, they can be the source of infection for many years. Tomato worms, in particular, can transfer diseases from the goji to other plants in the area, which could result in a long-term disease epidemic. Fungal disease in the goji plant can be prevented by keeping the leaves as dry as possible. Plants should be watered in the early morning and also from the bottom. Monitor your goji berry plant from June to October to determine when the goji berries are ripening. Goji berry bushes ripen at different times during the growing season in different climates. Goji berries are ripe when they turn bright red and they are juicy, not firm, on the inside. But don't harvest too late. At the end of the season, the goji berry fruit will burst open to disperse its seeds on the ground and it will be too late to harvest the berries. Grasp the small stem that connects the goji berry to the main stem with your thumb and forefinger. Stabilize the main stem with your other hand, and pull the goji berries off one by one. Wash the goji berries before consuming them, even if they are home grown. Goji berry shrubs will start producing at least two pounds per plant by its second year, Victoriana Nursery Gardens says. 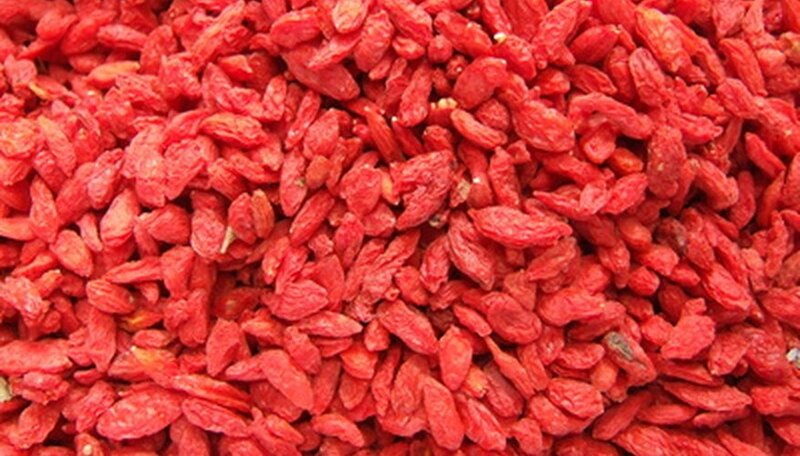 Goji berries belong to the genus Lycium and are also known as wolfberries. They have many health benefits. According to the United States Department of Agriculture, goji berries (Lycium barbarum) can be grown in all of Florida. The plant is a vine, a member of the potato family, and is known as Duke of Argyll's tea tree, Chinese Wolfberry and Matrimony Vine. The scientific name of the goji berry is Lycium barbarum. Lycium stands for the genus, indicating that the goji berry is destert-thorn, according to the USDA. Barbarum designates the species, setting the plant apart from others in its genus, such as the water jacket and the Carolina desert thorn. 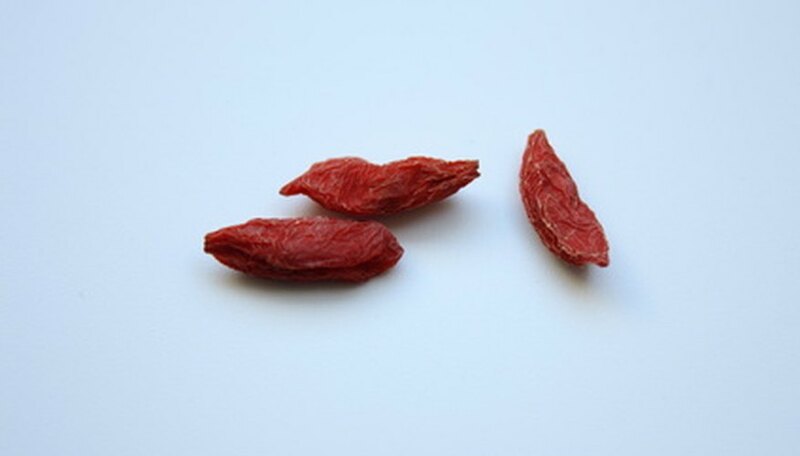 The goji berry is known by several common names, including the wolfberry, the matrimony vine, the lycii berry and the Duke of Argyll's tea tree. The western snowberry is also attributed as one of the goji berry's names, but it is actually a different species, Symphoricarpos occidentalis, not even in the same genus as the goji berry. Goji berry is the name that the fruit is most often marketed under. There is no definitive source for the term \"goji,\" but goji is an anglicized version of the mandarin word for the berry: g?uq?. One of the regions in which it grows has a similar-sounding name: Gojal. Goji berries are consumed in a variety of ways. They can be eaten dried by themselves or added to trail mixes, salads or muffins. They can be put in pastas, casseroles, smoothies and homemade energy bars. Additionally, goji berries can be made into many different desserts. They can be dipped in dark chocolate to add more antioxidants to a diet or used to make cookies, pies and fritters. Goji berries are also used to make healthy juices. Although there are prepared goji juices available, making goji juice is quite simple by placing dried goji berries in drinking water. Those who prefer stronger juice can allow the berries to soak for a day while those who prefer a weaker juice can allow them to soak for a few minutes. The goji berries can be chewed while drinking the juice; they can also be removed if desired. However, greater health benefits, including increased fiber, result from eating the berries as well. In addition to making juice from dried berries, goji berries can be combined with other ingredients to make healthy drinks. A fruit juice, such as orange juice, combined with fresh fruit chunks and a handful of goji berries can be blended with ice into a delicious smoothie. Other smoothie recipes blend dried goji berries with brewed green tea and yogurt for additional health benefits. Most fruit smoothie recipes can be enhanced by blending goji berries with the traditional ingredients. Cut the wolfberry bush down to size. If left to grow unchecked, it may reach up to 8 feet in height. Prune the tips of this year's green branch shoots to encourage them to branch sideways, instead of outward, to fill out the bush. Prune any branches that touch the ground. They will put down roots and spread all over your garden otherwise. Prune any branches that have rooted, and dig up the roots. These can be transplanted elsewhere to grow new wolfberry bushes. Prune out any dead or broken wood in winter when the wolfberry is dormant. Goji berry plants are not invasive pests. 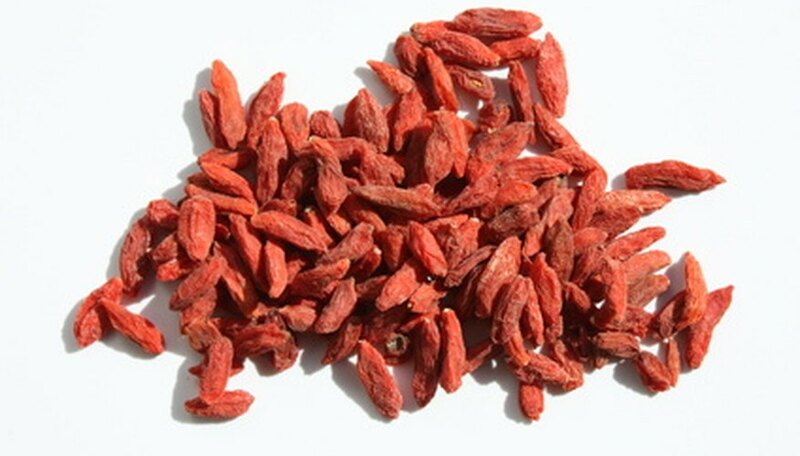 Goji berry plants grow natively in the mountain regions in China. Most soil in North America is too fertile for the plants to grow well in. Goji berries are grown commercially in parts of Utah.